The α4-structure, alias the “logical cube” (or logical bi-tetrahedron), which is the successors of the logical hexagon (i.e. the α3-structure) in the series of the n-oppostions (or series of the α-structures) has been discovered by Moretti in 2004. It expresses the notion of 4-opposition (i.e. it is built on top of a blue tetrahedron of 4-contrariety, from which can be deduced – by the respective contradictions of each of its four vertices – the dual green tetrahedron of 4-sub-contrariety). From the point of view of OG, the immediate avatars of the logical cube are: (i) from the viewpoint of n-opposition, the α5-structure (i.e. the oppositional bi-simplex of dimension 4, or “bi-hypertetrahedron”, expressing 5-opposition); (ii) and from the viepoint of the theory of the poly-simplexes the logical tri-simplex of dimension 3 (or “logical tri-tetrahedron”). As it happens, at least three people have been close to discovering the logical cube several years before 2004 (but they seemingly failed). 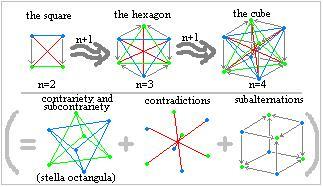 First, Sesmat, who is one of the discoverers of the logical hexagon (with Jacoby in 1950 and Blanché in 1953) had almost discovered it, at least as for its two constitutive contrariety and subcontrariety tetrahedra, but he does not seem to have realised that, once the subcontrariety arrows drawn, the structure becomes a “logical cube” (he did not give such a cubic representation of it). Second, Sauriol, who discovered the logical tetrahexahedron in 1968 (against Blanché and by using some ideas of Piaget), but who did not want to enter a generalisation of his own discovery (his aim seemed to be to put an end to Blanché’s “sedition” against analytical philosophy) does not seem to realise that inside this structure he presents there is, a bit hidden, a logical cube. Third, Béziau, who draw back the attention of some logicians to the forgotten (or unknown) logical hexagon in 2003 tried to figure out a way to go beyond it: that is, going from 3-opposition to 4-opposition (Béziau spoke of dichotomy, trichotomy and quadritomy). But he tried to do this by using a blue square (instead of the blue triangle of the logical hexagon), not realising that the right geometrical ingredient for going effectively beyond the logical hexagon would have been a blue tetrahedron. The key element seems to have been to think in terms of hyper-space. What brought Moretti on that path (i.e. thinking oppositions through the hyper-space) was some familiarity with the psychoanalytical theory of Matte Blanco, who models the human mind not only in terms of “bi-logic”, but also with n-dimensional spaces and therefore has to explain to his readers, as a pedagogical preliminary, some very basic intuitions about what can be a 4-dimensional geometry.